Sunday 29, 2014. Fishing time 6:00a.m. To 5:00p.m. Scale will be open until 6:00p.m. for more information call Jennie at 651-3850. 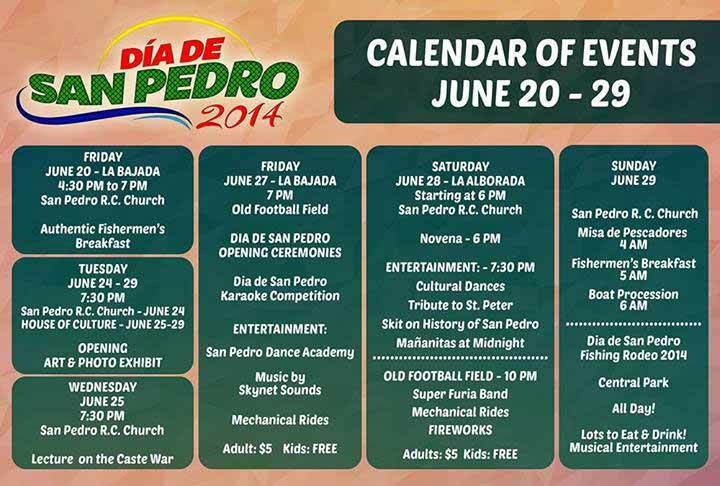 The San Pedro Town Council and the San Pedro House of Culture organized a weeklong celebratory event that lead to the celebration of Dia de San Pedro (San Pedro Day) on Sunday, June 29, 2014. The activities paid homage to the island’s patron saint and highlighted the rich history and culture of San Pedro, Ambergris Caye. 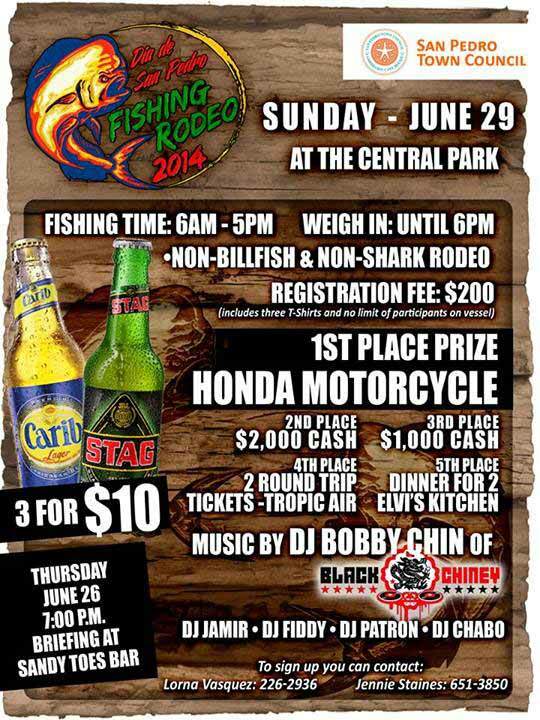 Events kicked off on Friday, June 20, 2014, with the religious traditions of “La Bajada” and authentic fisherman’s breakfast which then led to a week-long art and photo exhibit featuring the founding members of the Caribeña Producers Cooperative, as well as San Pedro fishermen. 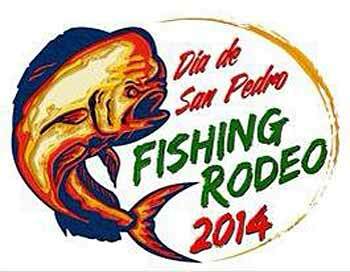 Friday, June 28, marked the opening of the Dia de San Pedro festivities which included the return of the Dia de San Pedro Karaoke Competition and the Dia de San Pedro Fishing Rodeo. Also making its comeback were the mechanical rides for all to enjoy. 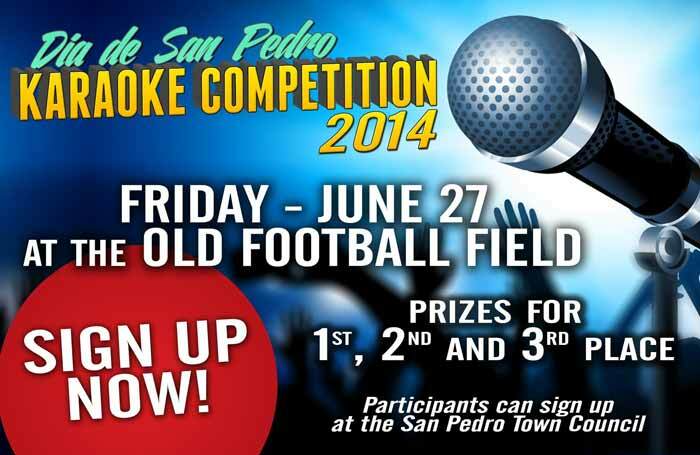 On Friday's opening night, the festivity had the participation of the San Pedro Dance Academy and the return of the Dia de San Pedro Karaoke Competiton which had the contestants sing infront of a live audience and panel of judges to with a grand cash prize. In the end, Mr. Pablo Cob proved to be victorious overall with Mr. Wilber Rivero coming in second place and Mr. Jaime Bautista in third place. On Saturday night - June 28, the festivity opened with dance presentations from the San Pedro Dance Academy where they were accompanied by students from the Dance Factory of Winsconsin and put on a spectacular show. The show then continued with a mariachi presentation from Mariachi Tierra Maya from Chetumal, Quintana Roo which had the crowd and cheering for more. And lastly, the Super Furia Band had the crowd dancing with their catchy songs and uptempo beats. On Sunday - June 29, the traditional Fishermen's Mass, breakfast and boat procession took plae in which many assisted to this event. The crowd were serenated by Mariachi Tierra Maya while enjoying their breakfast treats. Mariachi Tierra Maya also performed at the Boat Procession.